The dune field adjacent to McQueen Inlet has displayed tremendous dynamics where this portion of the shoreline was originally accretional. 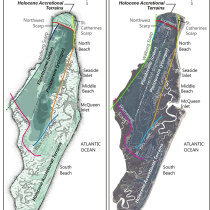 A recent study has evaluated shoreline dynamics and environmental change on St. Catherines Island, Georgia with attention paid to the two major controls of barrier island formation and modification processes (Meyer, 2013). These major controls include (1)the increase in accommodation space, or the rate of sea level rise for the Georgia Bight which has remained constant in 20th- and 21st- century tide gauge data and (2) dynamically changing rates of sediment supply based on anthropogenic modifications to land cover and fluvial systems (Trimble, 1974) that are reflected in sediment mass flux to the southeastern United Sstates coast (McCarney-Castle et al., 2010). The island is dependent on the net longshore transport of sediment from the north; the closest fluvial system with appreciable discharge is the Savannah River. The evaluation of anthropogenic modifications to the rate of sediment supply within the Savannah River watershed indicates that in spite of significant changes in sediment flux rates (+300 percent in 1859—1951 [pre-dam era] and -20 percent in 1951—2012 [post-dam era]), shoreline retreat on St. Catherines Island was continuous during the study period with an acceleration noted in the rates of shoreline retreat associated with spit and berm landforms during the post-dam era. This association indicates the rate of sediment supply plays a secondary role to the major control of the rate of sea level rise in the formation and modification processes at St. Catherines Island. Results also indicate the portion of the shoreline characterized as erosional increased from 84 percent in 2005 to 92 percent in 2013. Shoreline retreat adjacent to St. Catherines Sound ranged from -1.0 to -2.0 meters per year (m/yr), ranged from 0.9 m/yr to –3.0 m/yr along Yellow Banks Bluff, ranged from 4.2 m/yr to -6.9 m/yr along Seaside Spit and Middle Beach, and ranged from -0.9 m/yr to -3.8 m/yr along South Beach with extreme rates of erosion observed along the margin of the island adjacent to Sapelo Sound where rates reach a maximum of -8.7 m/yr. 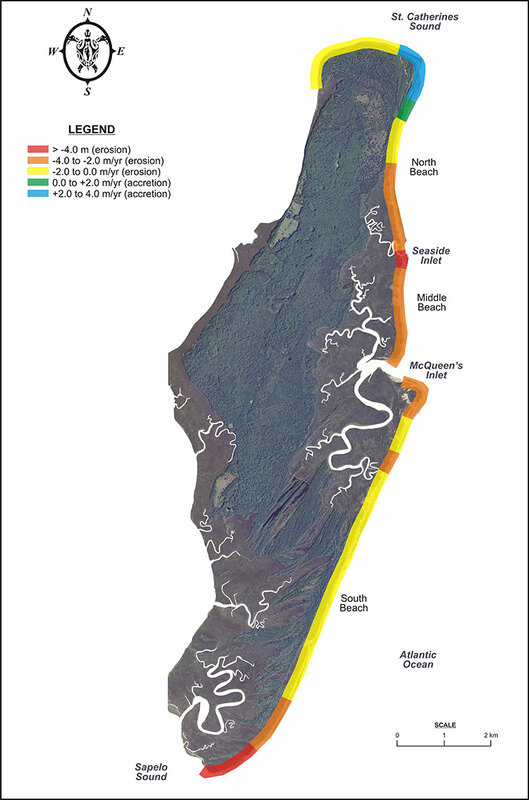 The dune field adjacent to McQueen Inlet has displayed tremendous dynamics where this portion of the shoreline was originally accretional; however, the area has been erosional since the time interval of 2005 to 2006 and continues to be erosional in 2014. The sole zone of active accretion is located in the northeastern portion of the island with a mean accretional rate of +3.7 m/yr. This accretional portion of the shoreline is limited to approximately 1.5 kilometres of the total shoreline and is proximal to a large ebb tidal delta in St. Catherines Sound that provides a local sand supply and refracts waves around the northeastern shore, limiting the effects of sea-level rise and erosion. Monitoring the shoreline and collecting of data will remain ongoing as efforts to support conservation efforts on the island and provide shoreline projections continues. 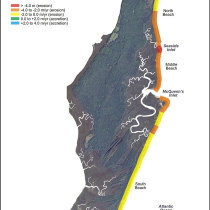 The effects of sea level rise and shoreline retreat are evident at Seaside Spit where the beach berm retreats across the landscape at a rate exceeding 6 meters per year. The shoreline retreat is actively eroding the marsh environment and is exposing relict marsh muds on the beach. The highest rates of shoreline retreat are observed on the extreme southern portion of the island where more than 400 meters of the island has been lost since 1951 at an average rate of more than 6 meters per year. Bishop, G.A., Hayes, R.H., Meyer, B.K., Rollins, H.E., Rich, F.J., Thomas, D.H., and Vance R.K., 2007, Transgressive Barrier Island Features of St. Catherines Island, Georgia, In Rich F.J. (ed), Fieldtrips of the 2007 Annual Meeting, Southeastern Section, Geological Society of America. Georgia Southern University (Statesboro, GA), p. 39-85. Ferguson, S.M., Rich, F.J., and Vance, R.K., 2010. A palynological investigation of the Central Depression on St. Catherines Island, Georgia. Geological Society of America Abstracts with Programs, Vol. 42, No. 1, p. 175. Hails, J.R. and J.H. Hoyt, 1969. An Appraisal of the Evolution of the Lower Atlantic Coastal Plain of Georgia, U. S. A. Transactions of the Institute of British Geographers, No. 46: 53-68. Hayes, R.H., and D.H. Thomas, 2008. Hydrology of St. Catherines Island. In D.H. Thomas, Native American Landscapes of St. Catherines Island, Georgia: The Theoretical Framework. Anthropological Papers of the American Museum of Natural History 88 (1): 56–58. Reichard, J.S., Nelson, B.R., Meyer, B.K., and Vance, R.K., 2014. 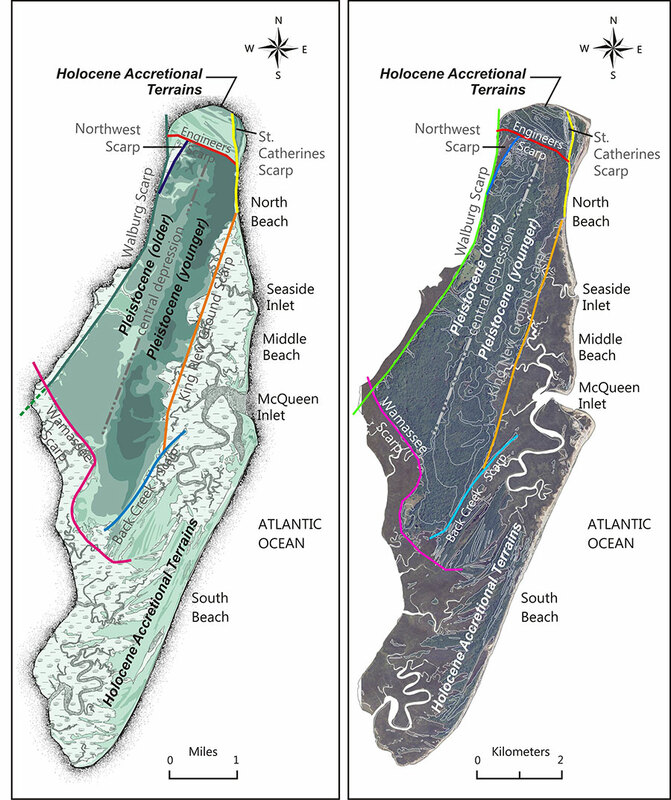 Evidence for Saltwater Intrusion in the Upper Floridan Aquifer on St. Catherines Island, Georgia. Southeastern Geology Volume 50, No. 3, p. 109-122. Trimble, S. W. 1974. Man-induced soil erosion on the southern Piedmont 1700–1970. Ankeny, IA, Soil Conservation Society of America, 180 p.
Vance, R.K., Bishop, G.A, Meyer, B.K, Rich, F.J., and Reichard, J.S., 2011. St. Catherines Island, Georgia: Sag Structures, Hydrology, and Sea Level Rise. Southeastern Section Geological Society of America, 60th Annual Meeting, Wilmington, N.C. PLEASE NOTE: Because of our small staff and the sensitive nature of the ongoing scientific work on the island, St. Catherines Island is closed to the general public. Please respect this privacy, and allow the many scientists and educators dedicated to their research to continue their valuable work undisturbed. THANK YOU.